You may quickly move to a particular part of the object. To move to a particular part of the object being viewed/edited, enter the required offset in the Go to Offset field between the buttons. You may also use the Go To Offset dialog box to go to a specified place in the object. Click the Offset field on the Status bar. You may also use this dialog box to copy the offset. Jump / offset direction. For example, if you need to find the offset from the object end for a selected byte, switch to the End (backward) option. Switch between the hexadecimal and decimal data representation. Range of values that can be entered. Flat data offset (without separation between the sector and offset in the sector). Data offset represented as a sector and offset in the sector. The Go! button moves the cursor to the specified positions, but the Go To Offset dialog box remains open. The OK button closes the dialog box after moving the cursor. To search for a particular string, click the Find , Find Next , or Find Previous buttons or the same items on the Edit menu, and specify the string on the Search dialog box. Search for the place which content is not equal to the string. For example, the first byte not equal to 00 or FF . Select this check box to search for all instances of the string to search. Search results will be shown in the Find Results pane. 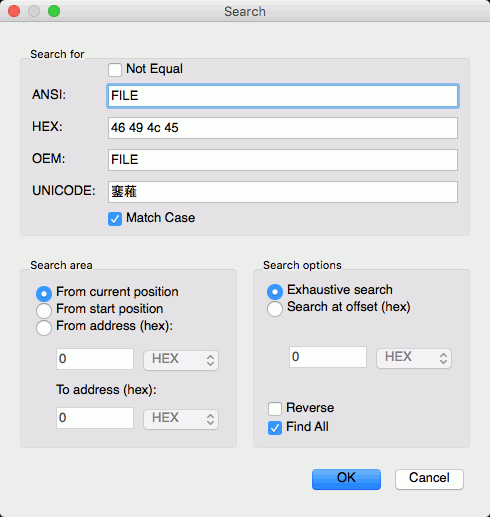 Text/hexadecimal Editor will show the search progress. Search results are shown on the Find Results pane. You may easily move to the required found item by clicking the item. And the search string is Not Equal FILE . If the Exhaustive search option is selected, the Text/hexadecimal Editor will stop at the first A character in Sector1 . 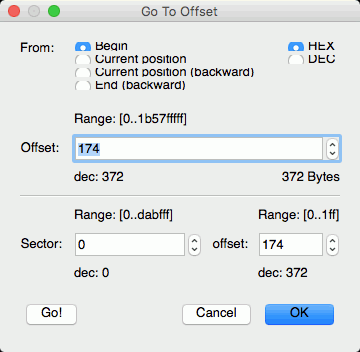 If the Search at offset=0 option is selected, the Text/hexadecimal Editor will stop at the N character in Sector3 . You may create bookmarks to easily move to those places. Control-click the cursor on the place you want to bookmark and select Toggle Bookmark on the shortcut menu. The list of bookmarks appears in the Bookmark pane. You may easily move to the required bookmark by clicking it in the list. You may control bookmarks on the Edit menu.